We all know that we should be eating more fruit and vegetables, but the latter can be difficult to incorporate into a busy everyday routine as they generally require more preparation than fruit. However, making vegetables the main component of your evening meal is a great way to make sure you are getting those important vitamins and minerals, whilst also helping you to lose weight, as the veggies filling your plate are most likely replacing something less healthy and more calorific! So, grab a couple of butternut squashes, some leeks, some French beans and a can of cannelloni beans (yep, pulses count towards your seven a day too, but only for one portion) and cook up this heavenly Roasted Butternut Squash. 1. Preheat the oven to 200˚C/400˚F/Gas Mark 6. 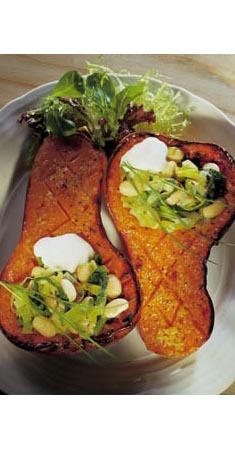 Cut the butternut squash in half lengthwise and scoop out all of the seeds. 2. Score the squash in a diamond pattern with a sharp knife. Mix the garlic with the olive oil and brush over the cut surfaces of the squash. Season well with salt and pepper. Put on a baking sheet and roast for 40 minutes until tender. 3. Heat the walnut oil in a saucepan and fry the leeks and mustard seeds for 5 minutes. 4. Add the drained cannellini beans, French beans and vegetable stock. Bring to the boil and simmer gently for 5 minutes until the French beans are tender. 5. Remove from the heat and stir in the rocket and chives. Season well. Remove the squash from the oven and allow to cool for 5 minutes. Spoon in the bean mixture. Garnish with a few snipped chives and serve immediately with the fromage frais and a mixed salad.